Over the next few months, Sue Scheele will write a series of blogs on the medicinal uses of our home-grown plants. First up, the ubiquitous kawakawa – cough clearer, tooth-ache reliever and headache buster. Over to you Sue! Take a quick look at the shelves of your pharmacy or supermarket and you’ll find a myriad of herbal remedies for common ills. A closer inspection however will reveal these products are mostly derived from introduced plants, which have a long history of medicinal use in Europe. But that’s not to say that our native plants don’t have the therapeutic properties of their European cousins. For instance, Murdoch Riley’s book “Maori Healing and Herbal” (1994, Viking Sevenseas) has over 500 pages of medicinal information, reflecting the depth of Maori knowledge developed over centuries of observation and use. Some of these plant remedies are still widely used today, by both Maori and pakeha, and the ritual and spiritual aspects remain relevant in Maori communities. But whether we use them or not, I think knowing about their special properties enriches our experience of native plants, and provides another reason to work to halt the loss of biodiversity in Aotearoa. Kawakawa is an easily recognized shrub, with aromatic, heart-shaped leaves, that grows widely in coastal lowlands, as far south as Christchurch. It’s a lovely garden plant in areas that are free of hard frosts. A look at the leaves of kawakawa gives us a clue as to why the first arrivals here from Polynesia called it that. The leaves are like its relative, kava (Piper methysticum), used widely in the South Pacific as a ceremonial drink. Kava has a mild narcotic effect. Kawakawa doesn’t have those properties, but the spicy leaves are highly valued for relieving bronchial complaints. Boil a handful of the fresh, young leaves in a small saucepan of water for 15-20 minutes, then drink half a cup of the liquid to relieve chesty coughs. To make a pleasant tea, for use as a general tonic, it’s best to dry the leaves first, then use a small quantity in a teapot. It’s very good for relieving indigestion. The leaves can be put into hot water, bruised, then used as a poultice on cuts, boils and sores, bruises and to relieve neuralgic (head & face) pain. Kawakawa leaves were commonly used in steam baths for rheumatic and arthritic pains. Great weblog idea to promote natural remedies. The fruit of kawakawa are delicious and often hard to come by as the birds seem to like them as well. Thank you for sharing your knowledge, Sue. I’ll look forward to your next instalment. From what I was told by a kaumataua I understood for Kawakawa tea it was best to take leaves full of holes (Not likely to be young leaves?). Would taking leaves full of holes mean that new growth would be protected? I’ve heard that comment before, re kawakawa with holes in being more effective, but I can’t tell you why that would be so. I’ve never come across that remark in the old literature, though a lot has been written about the usefulness of kawakawa. But I’m sure regular users of the plant will have found out what works best for them. In most bush areas you’d be hard-pressed to find kawakawa leaves without holes! The holes are caused by a looper caterpillar, the larva of the moth Cleora scriptaria. These caterpillars are nocturnal feeders, so not usually seen. They will happily eat both old and young leaves – though are somewhat random in their attacks – and eat other leaves as well, like horopito. The reason they prefer leaves with holes in is that the insects know which ones are best to eat – so I was told by a kaumatua. In case you might think all leaves on a plant are equally good, a friend from the Takahe research team once told me that Takahe often “taste” leaves from one tussock bush before deciding which ones to eat. Thanks for the Cleora info Sue – that’s what I was looking for! Would this be safe in pregnancy? I’m not a medical practitioner or naturopath so can’t clarify this for you, and you should check with your preferred practitioner. Kawakawa contains myristicin, also found in nutmeg and parsley. We know that very high doses of nutmeg have a psychoactive effect which can be damaging, but I don’t imagine you could drink enough kawakawa tea to be a problem! Hi, has anyone got any ideas on traditional Maori management of kawakawa? Was there a certain time of year that the leaves were harvested or could they be taken when required? Were there any rules about the taking of the leaves and other plant parts? Thanks! I love the Forest and Bird web site. I use it a great deal for study! I am active and gym everyday, since making my own kawakawa tea daily I have increased in strength endurance by about 20 % and feel a lot healthier. I recommend 1 kawakawa tea every 72 hours. kawakawa produces an enzyme which has the medicinal properties in it – the enzyme is strongest in the leaves with the holes. The holes are caused by the enzyme eating the leaves rather than insects. Shea,could you kindly share with us how you make your kawakawa tea? Brian….. I have only just come across this website and it is of much interest to me. 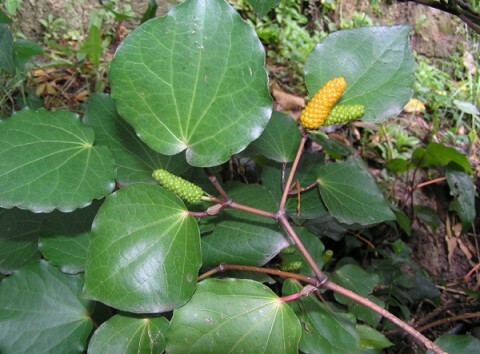 I was diagnosed with kidney failure, (Stage 4), when I was introduced to Kawakawa by a Kaumatua. I was advised to pick a couple of leaves with holes in them and simmer them in a pot for 15/20 minutes. I add a small teaspoon of honey and have it with my meal. I have been drinking one or two cups of Kawakawa tea a day for around 2 months and when attending my Renal Specialist he was surprised by the significant increase in my kidney function. He asked what I was doing differently that may have caused this but I wouldn’t tell him because as a Registered Nurse i am aware that Specialists do not agree with natural remedies. He replied that even though I wouldn’t tell him, whatever it was I should keep doing it as it was of definite benefit. I was reclassified to Stage 3 and improving. Naturally I am excited about this. Also, like Shea, I have access to a gym and pool and so use it at least 5 times a week as part of my healing program and have found an extraordinary increase in my energies and strength endurance. I do have quite a few friends and family who have had similar benefits. I fully recommend making Kawakawa Tea part of your daily habit. Thanks Will, great to hear that your health has improved since you have been using Kawakawa leaves. My neighbour’s have suggested, tear them rather than cutting prior to simmering and adding a 1/4 teaspoon on ground ginger. How many leaves should be used, say per cup of water? recommended it to friends who have had similar results. No side effects. I have found it not so easy to find the leaves with holes in them. C.
Could you please share what is the best way to dry kawakawa leaves? I use 3 mature leaves with 1/4 tsp of ginger and a chunk of lemon or lime with the skin on. My migraines have been completely cured. I was told the leaves with the holes are preferred by the bugs eating them because they have a higher content of the medicinal power. I wash and dry fresh leaves and then place on a paper towel in a single layer, cover with another paper towel and microwave in series of 30 second bursts until the leaves are brittle. Takes about 3 minutes. Infuse a teaspoon of dried kawakawa in a cup of boiled water about 5 minutes.